“Rosa,” the first historical story of the season, made me cry about the heroism of a real-life woman. “Demons Of The Punjab,” the season’s second historical episode, made me cry about the humanistic mission of a fictional alien race. It’s a quintessentially Doctor Who idea that after suffering the unimaginable loss of their planet and their people, the Vajarians decided to give up their own blood-thirst and ensure that no deaths ever went unwitnessed and unhonored again. It’s also an idea that helps provide a sense of comfort and peace to a gutwrenching episode with no real happy ending. Like “Rosa,” “Demons Of The Punjab” is an episode in which the Doctor and her TARDIS team witness history unfold more so than actively shape it. Even more than a companion to “Rosa,” however, it feels like a spiritual sequel to the show’s iconic first season episode “Father’s Day.” In that one, Rose Tyler traveled back through her own timeline to witness her father’s death. In this one, Yasmin Khan nips back in time to see the truth of her grandmother’s life. Following the psychic energy of an heirloom watch to the Punjab region of 1940s India, Yaz discovers a chapter of her life that her grandmother Umbreen (Leena Dhingra) has never shared before—her brief, tragic first marriage and her direct experience with the Partition of India. I’ll note right off the bat that this episode is probably going to play somewhat differently for British and American audiences. “Demons Of The Punjab” is trying to shed light on an underexplored element of history, but for British audiences that means filling in the details of an event with which they’re likely vaguely familiar, while for American audiences that means educating them about a part of history they might not really know anything about at all. 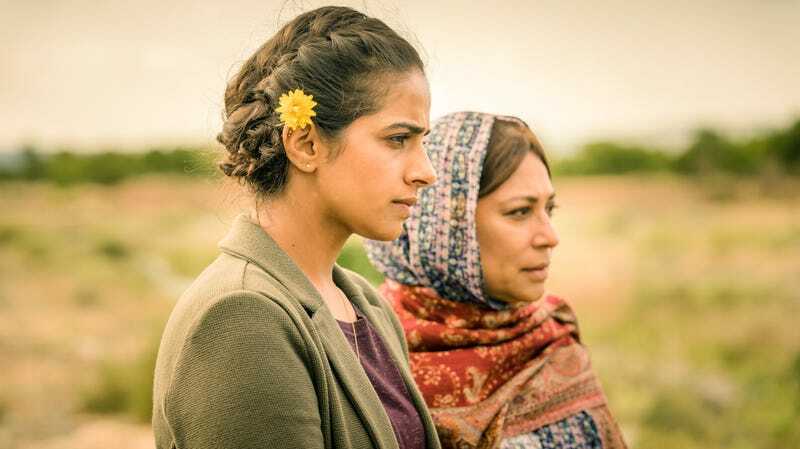 (As an American who studied British history in college, I’ll admit to sometimes getting those distinctions a little fuzzy, but it definitely feels like “Demons Of The Punjab” does less historical handholding than “Rosa,” which was depicting an iconic piece of American history for a primarily British audience.) Instead of offering an overall primer on the Partition of India, “Demons Of The Punjab” focuses specifically on the huge refugee crisis and loss of life that accompanied the 1947 division of British India into the independent dominions of Hindu-controlled India and Muslim-controlled Pakistan. Doctor Who doesn’t shy away from the enormity of the tragedy that followed. The Doctor notes that tens of millions of people were displaced and over a million people were killed during the chaos that followed the partition. The episode distills those almost unimaginably large numbers into the small-scale tragedy of Yaz’s grandma Umbreen (Amita Suman as the young version of the character) and her doomed fiancé Prem (Shane Zaza). Though they’re lifelong neighbors and friends, Umbreen and Prem’s interfaith marriage (he’s Hindu, she’s Muslim) is enough to garner controversy even before they learn that they’re living right on the newly created border between Pakistan and India. The “Radcliffe Line” represents a cynical vision of the world in which people of different backgrounds must be physically divided from one another. Umbreen and Prem’s love story represents the world at its best—a place where people are free to evolve and merge their cultures and traditions to enrich their lives, not limit them. Their makeshift wedding ceremony (officiated by the Doctor no less) combines elements of both of their faiths while celebrating the commonality of their shared experiences. The title of the episode turns out to be a bit of a red herring. The true demons of the Punjab aren’t the scary-looking aliens bearing witness to the crisis; they’re the human beings who get whipped into a frenzy over distinctions as arbitrary as borders and religion. That’s reflected in Prem’s brother Manish (Hamza Jeetooa), who was too young to join his older brothers in fighting alongside the British during World War II. Looking for purpose in a shifting world, Manish latched onto hateful ideas of “angry men on the radio,” and became adamant about the need to separate the Muslim population from the Hindu one. Writer Vinay Patel paints a chilling, pointed portrait about the way anger and xenophobia can lead to violence that quickly spirals out of control—even turning people against their own families and neighbors. 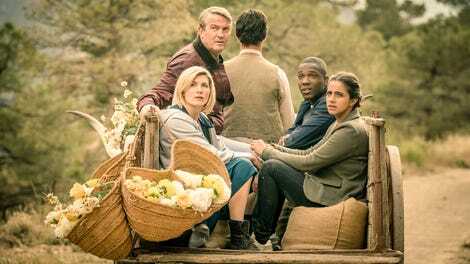 I’ll admit, as the first episode of the season not written by showrunner Chris Chibnall (Chibnall co-wrote “Rosa” with Malorie Blackman and penned all the other episodes himself), I had hoped that “Demons Of The Punjab” would bring a more decisively different energy to the season. But while the episode’s subject matter is new, its structure feels disappointingly familiar: There’s a big exposition dump when the team first arrive; the TARDIS Team split up with one faction getting to know the guest stars while the Doctor takes the others to learn more about the alien threat; and then mid-way through, the Doctor realizes she’s made a major miscalculation about the aliens’ motivates. The way “Demons Of The Punjab” handles its “the aliens aren’t actually the villains!” reveal is one of the strongest elements of the episode, yet it’s hard not to feel like it would’ve been even stronger if the previous two episodes hadn’t had similar reveals. Given that the Vajarians wind up serving as an emotional fulcrum rather than a plot one, I’m also not sure we needed the extended scene of the Doctor, Ryan, and Prem investigating their hive ship—especially when the fractured relationship between Manish and Prem is so much more important and so much less explored. All of the guest cast wind up feeling underserved in an episode with a lot of moving parts and not quite enough focus. But if “Demons Of The Punjab” represents some of the weaker impulses of Chibnall’s era of Doctor Who, it also reflects some of the best as well. Like “Rosa,” it’s an episode I found hugely moving even as I can intellectually see some of its flaws. Both episodes marry big, historical ideas with small, personal stories of perseverance that manage to find hope without sugarcoating the past. The tragedy of Umbreen’s youth is part of who she is, but it doesn’t define her entire life. Her story is one of sorrow, but it’s also one of resilience. She may not be able to step outside her own narrative to see it that way, but thanks to a mad woman with a box, Yaz is able to see her nan’s journey in a whole new light. This episode also provides a pointed reminder that World War II’s Allied forces included many soldiers from colonized countries. It’s another idea that’s presented without a ton of context for American viewers, though. I’m curious whether the TARDIS team visited Sheffield specifically for Umbreen’s birthday or if they’re regularly making stops back there in-between their adventures. It was nice to see Graham and Yaz get a scene together. I really liked the multi-eyed look of the Vajarians. That being said, I loved the Doctor’s delight over getting to participate in the women-only bridal henna party. I also loved the detail of older Umbreen critiquing her mom’s henna designs when she saw them on Yaz in the present. The whole last scene between Yaz and older Umbreen was really great. While officiating the wedding, the Doctor mentions that she has her own faith, which is something that tracks with what we know about the Doctor but has never really been spelled out so explicitly before.